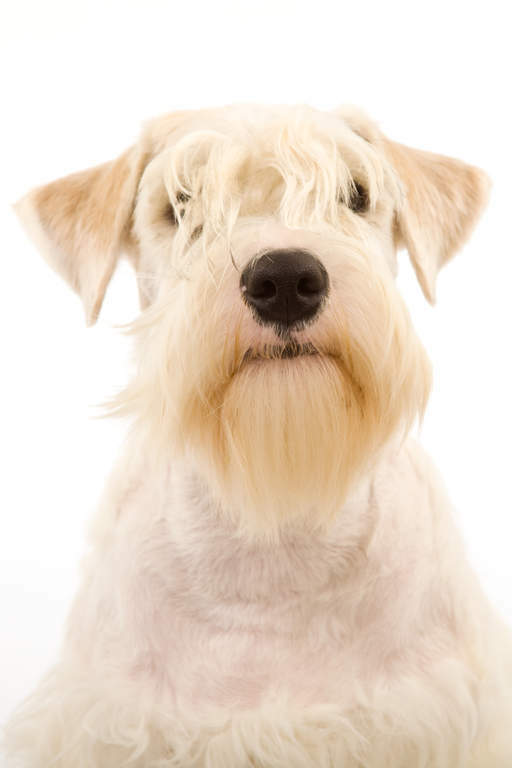 Originating from Wales, the Sealyham Terrier's exact origins are a mystery. In the 1800's the first documented case of the breed was recorded by Captain John Edwardes of Sealyham who worked for 40 years to establish the breed we know today. They were bred to hunt vermin around the home and farms. Going to ground after fox and badger was common place, but they also excelled at hunting otter. Their popularity has waned and they are classes as quite rare nowadays. These are plucky, determined and tough little dogs who are devoted to their family and always ready for adventure. They are the most docile of all Terrier breeds, but still an active, keen nosed dog who loves a good walk and the chance to explore. They are good with respectful children and other dogs if raised with them, but can be reserved with strangers. They were bred to hunt in a pack and usually gets along well with other dogs if properly socialised. The Sealyham is a cuddly dog who likes to be around it's family and will happily take a nap with you on the sofa or anywhere comfortable. They are calm and friendly around those they know and like to follow you around. They can suffer from separation anxiety if not accustomed to being left alone. They can also be destructive and bark if left for too long. Many owners describe them as little clowns that love to play and entertain. They make good watch dogs and will bark when someone is at the door, but really enjoy sleeping. They will often be found asleep on the sofa/bed - described as the couch potato of the Terrier world. The Terrier trait of hunting is still present in the breed, but they are less inclined to hunt than most other Terriers. They can live with cats, birds etc if taught from an early age. They are stubborn and learn more slowly than other breeds, but are capable of learning and like to please you. Play and reward based training is best as they get bored quite quickly. They will try and take over if they don't receive consistent training. They have moderate exercise needs and a long daily walk is enough to wear this little dog out. They like adventure and new smells and will usually come back on command, if it suits them. If they find a rabbit hole, they will probably try and dig down as far as possible, so best walked in a secure area or on a lead. Their wiry coat needs brushing 2 - 3 times a week, more often if it gets dirty as the white coat can stain. They need clipping every 3 months for pets and stripping for show dogs. They have a tendency to put on weight which can cause problems with their back, so food intake should be monitored. Lens Luxation can also be seen in the breed. Sealyham Terriers have a calm and loving temperament. For a terrier they are less jumpy and boistrous but can still get involved with a good chase around the garden. 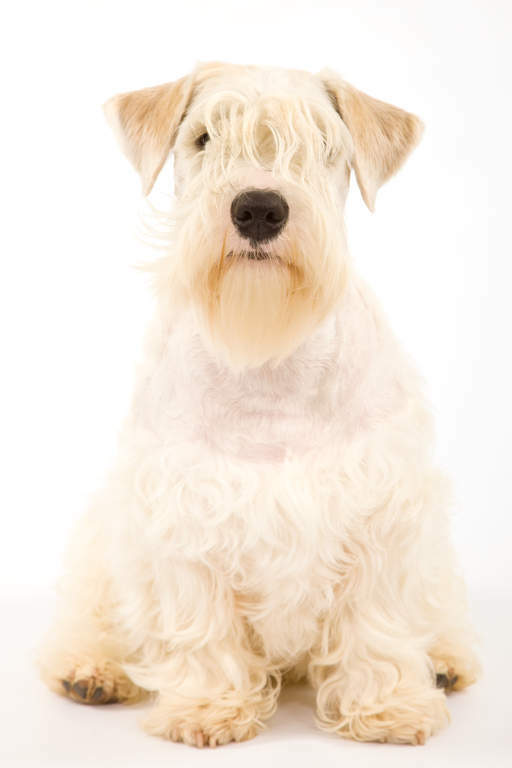 They will be devoted to their family but like most terriers will be tricky to train. 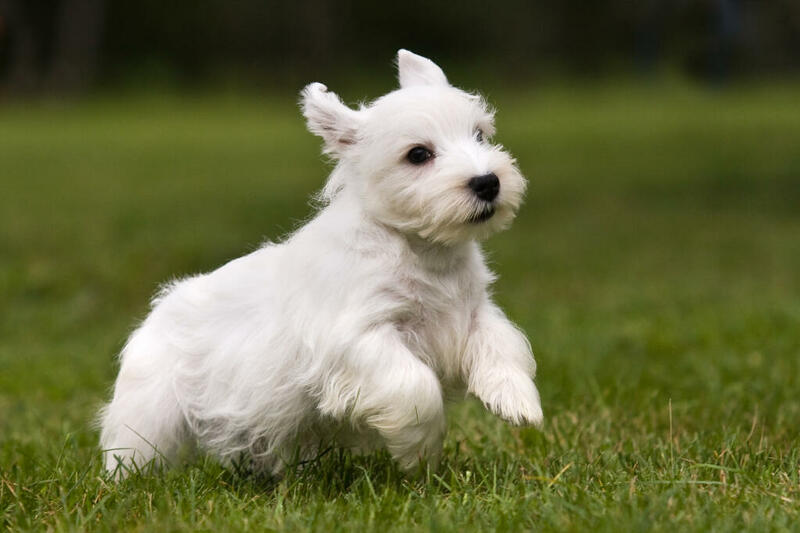 In this case plenty of positive reinforcement and consistent rules will help you gain the respect of your Sealyham Terrier. 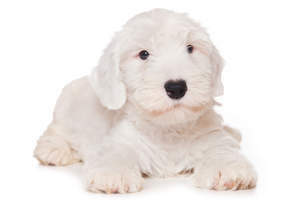 Health problems that may affect Sealyham Terriers include lens luxation (detachment of lens inside eye which can cause blindness), glaucoma, cataracts, progressive retinal atrophy (PRA: degeneration of the retina which can lead to blindness), inherited deafness, allergies, intervertebral disc disease (pressure on spinal cord which can cause paralysis), canine hip dysplasia (CHD) and luxating patella (dislocation of the knee cap).